A detailed walk-through of how Strokes Gained works and how to use its methodology to your advantage by NOT comparing to the tour, but to yourself. The 2018 SG:Total tour leader. These days, you can’t watch a golf broadcast on the PGA Tour without hearing about Strokes Gained. In 2018, Dustin Johnson (pictured to the right) led the ‘Strokes Gained: Total’ category at 2.372, which means that on average, every time he teed up his golf ball to play a competitive round of golf on tour, he beat an average tour player by 2.372 strokes per round. But what does this actually mean? And how does it work in detail? 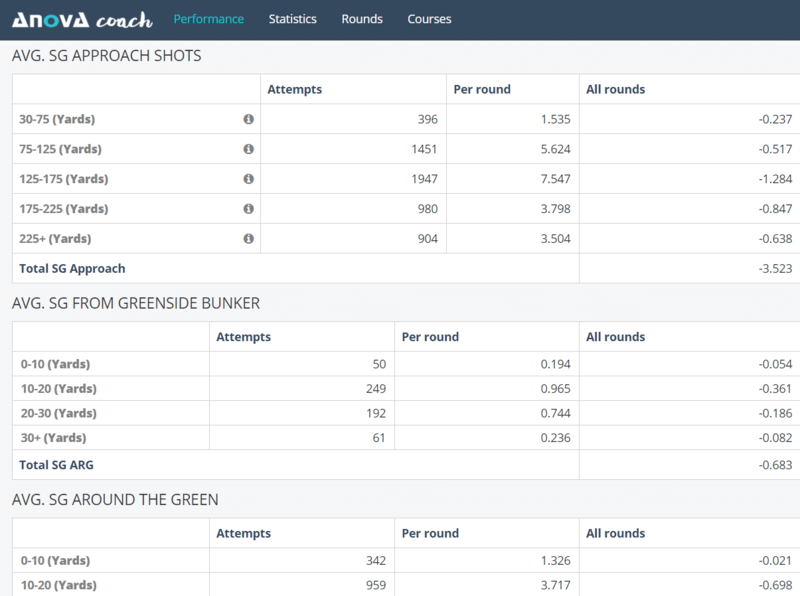 In order to understand the numbers, we have to start thinking in a dramatically different way about our golf games. Improvement at the highest level isn’t about improving in one-stroke increments; it’s about improving fractions of a stroke every time you hit a shot. But more about the quote above later in this article series; first we have to understand why traditional golf stats are tough to understand. Up until just a few years ago, the way to measure your golf progress was (other than looking at your actual scores) to count what we would now call “traditional golf statistics” such as driving distance, fairways hit, greens hit, scrambling, number of putts. These metrics are all easy to understand and relate to for golfers: it’s easy to tell if the ball hit the fairway or missed the fairway; whether you hit a green in regulation or not, and to count putts. For example, ‘Total Driving’ was the category people looked to to see who was the best driver of the golf ball (total driving is simply adding together a person’s driving distance and driving accuracy ranks on tour), but it falls way short of actually capturing what is happening on the golf course. Total driving, along with the other traditional stats, are somewhat useful as supporting variables, but as we’ll see below, they fall well short of actually capturing the nuances of a golfer’s performance. And since it isn’t entirely clear what they are measuring, it is also difficult to compare different players. Traditional golf statistics fail to capture the nuances of a golfer’s performance.